Zimbabwe's harvest will not meet the country's food needs and it will be forced to import food, the UN says. The UN Food and Agriculture Organization (FAO) says the country faces a shortfall of 325,000 tons of cereals this year. The Zimbabwean government has predicted a record harvest of 2.4 million tons of maize. But FAO says it expects the harvest to be less than half that figure - around a million tons of cereal crops. It says erratic rainfall, a shortage of quality seeds, deep poverty and a mismanaged land reform programme are behind the poor harvest. In a new report, the UN food body warns that between 30% and 40% of farmers may run out of food from their own production by the end of July. FAO's report comes days after a survey said 2.3 million rural people would need food aid in the next year. Experts from FAO were ordered to leave the country before they completed their mission, but they visited the major cereal-growing provinces of Mashonaland, Manicaland and Matabeleland. FAO's Henri Josserand, head of the Global Information and Early Warning System, told BBC News Online that he thought the country would be forced to import food to make up the shortfall. "If they bring all the food that is missing, they have the resources, but what will they do with the food - do they give it for free? Do they sell it? Will people be able to afford it?" Mr Josserand said. "Some [people] won't have enough money - those are the ones that we are concerned about - unless the government can give food for free, they will go without." FAO predicts a total harvest of some 950,000 tons of cereals - mainly maize, sorghum and millet. With its population of nearly 12 million, Zimbabwe needs a total of 2.35 million tons of cereals for the coming year, leaving a shortfall of 1.3 million tons. Almost a third of a million tons will not be covered by existing cereal stock or incoming orders and will probably be imported, FAO says. President Robert Mugabe's controversial land reform programme, which has seen thousands of white farmers forced off their land, has also affected harvests. The plan to change land tenure and redistribute white-owned land to black people has contributed to a plunge in agricultural production. Zimbabwe has been transformed from being one of the region's breadbaskets to supporting millions with food aid. "The way land reform has been managed has made it difficult for people," Mr Josserand said. "When there is a lack of tenure, a lack of credit, it's very difficult for people who have been allocated land to produce on a large scale, the system hasn't been followed through," he added. 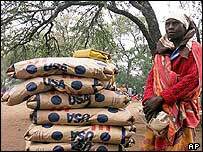 FAO says farmers are so desperate for seeds that they have been planting maize grain supplied as food aid.